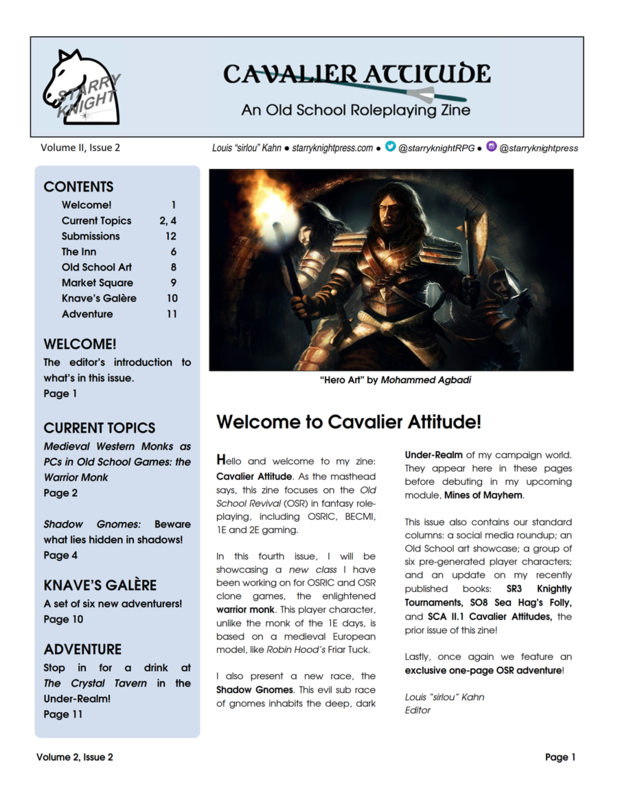 Here you can find all of the supplements and adventure modules we have published, and information on those that are coming soon! The books are listed in chronological order from my first to my most recent. You will find information on payment terms, shipping & handling charges, & sales tax below. Below are links to purchase our books directly from this website. The books are listed in chronological order, starting with our very first release SK1 The Corrupt Temple. Our first adventure module in the "SK series" is this stirring journey into the temple of an aquatic goddess. 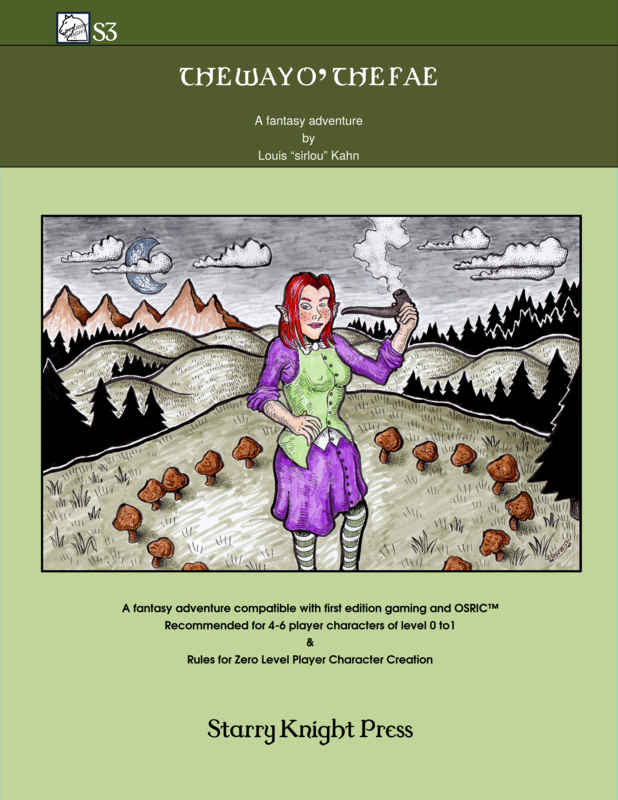 Created for 4-6 characters of 3rd to 5th level, it packs 40 pages of adventure! 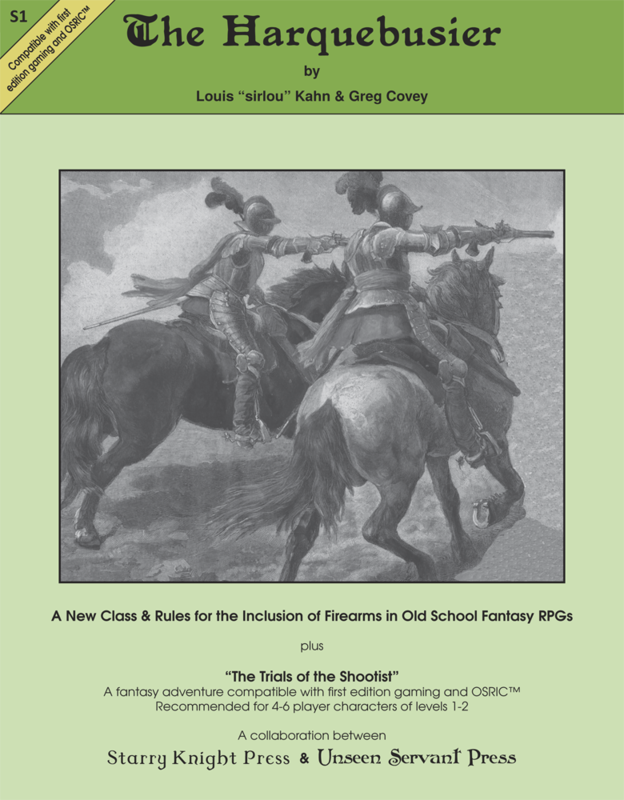 Our first supplement is "S1", which brings medieval guns and grenades into your Old School campaign! It also includes an original adventure for the exciting new Harquebusier class! Our second adventure in the "SK series" takes your party into (and beneath) a long forgotten wizard's tower. 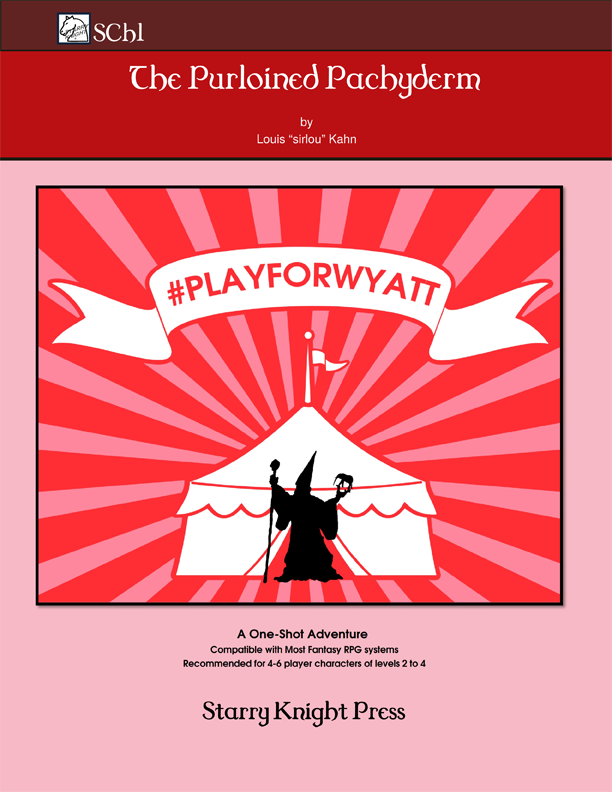 Created for 4-6 characters of 1st to 3rd level, it packs hour of play in its 40 pages! Our fourth book and the second in the "S series". 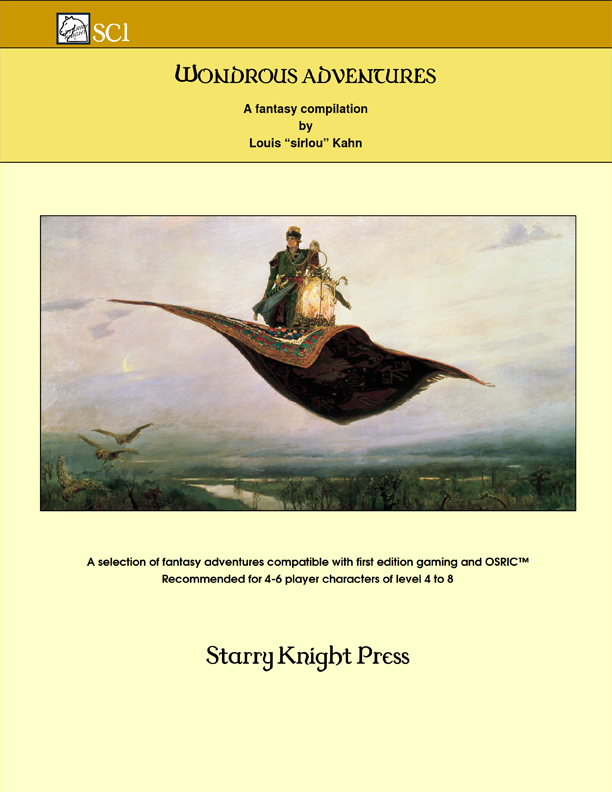 This supplement contains a series of four fantasy misadventures. 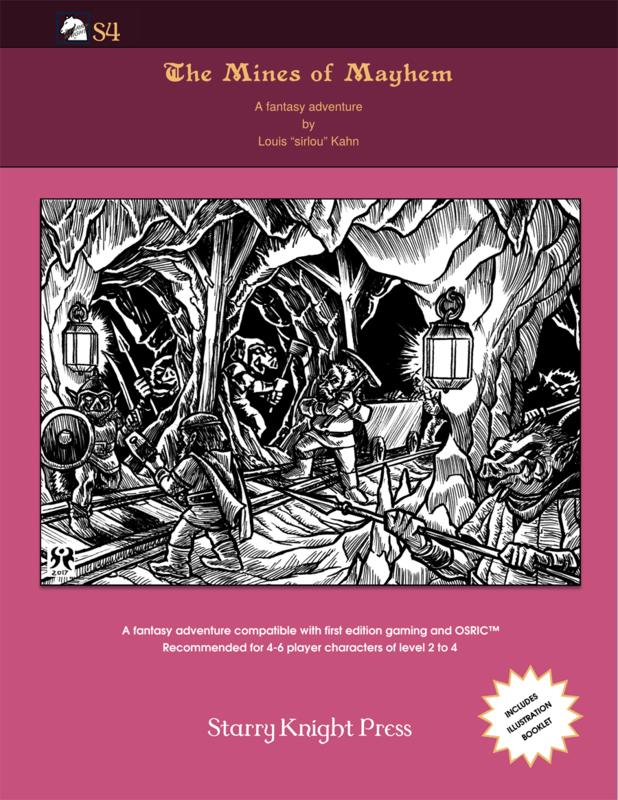 This collection of adventures is compatible with BECMI, 1E and 2E game systems, and is recommended for 4-6 player characters of levels 1-10. 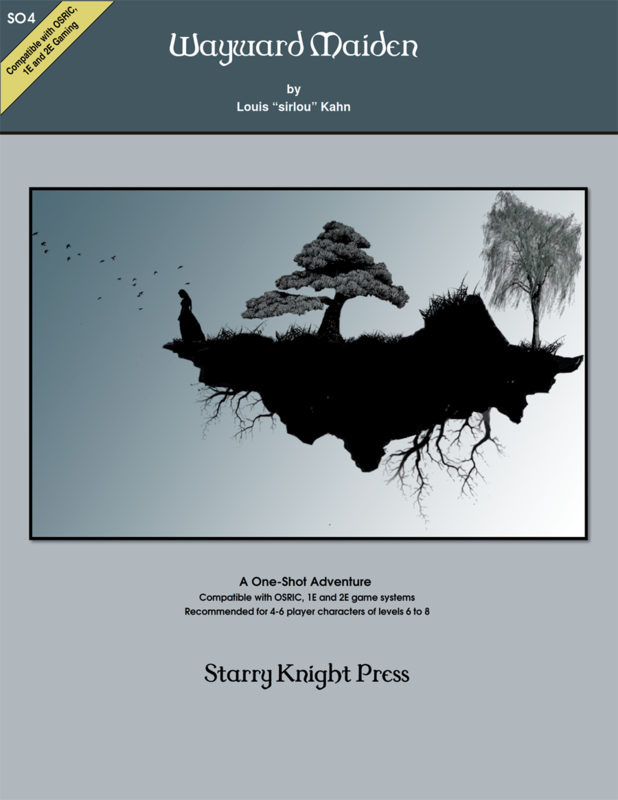 Our third supplement is "S3", an adventure in the Land of Faerie! A Zero Level PC Rules System is included. 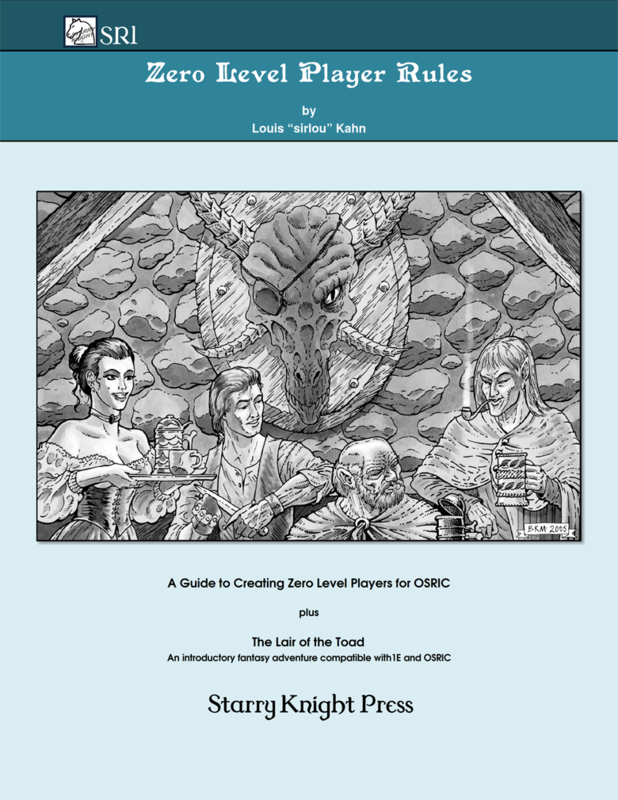 It's compatible with OSRIC, 1E and 2E game systems, for 4-6 player characters of levels 0-1. Our first one-shot module is "SO1", a thrilling adventure where players will be battling demons from the Planes of Hell! 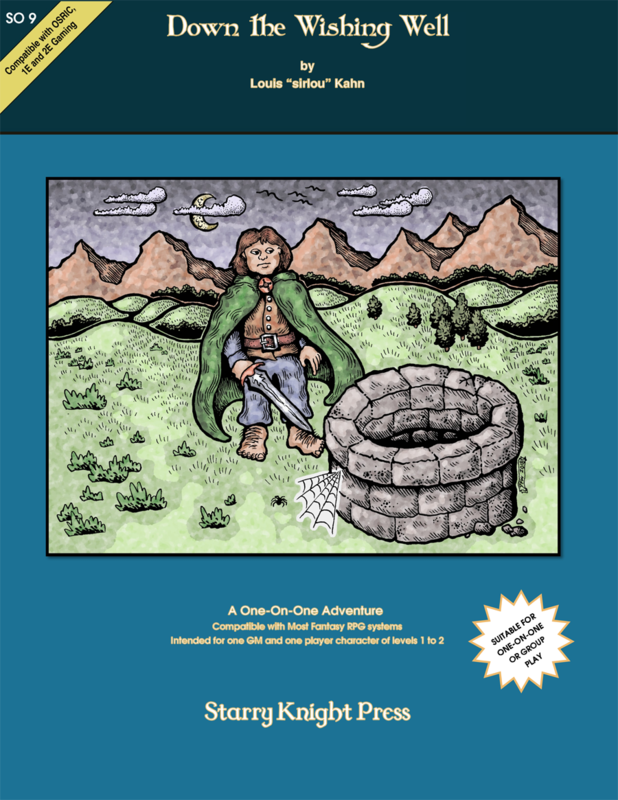 It's compatible with OSRIC, 1E and 2E game systems, for 4-6 player characters of levels 6 to8. Our second one-shot adventure is "SO2", an exciting module where where players will be defending a fort on the borderlands from invaders! 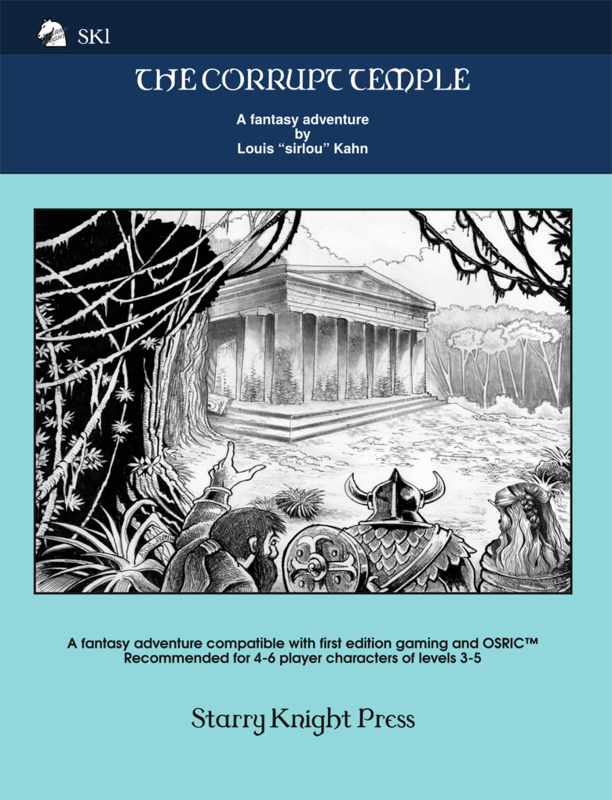 It's compatible with OSRIC, 1E and 2E game systems, for 4-6 player characters of levels 6 to8. Our eighth supplement is "SR1", which combines an innovative and cooperative zero level play character creation system with an exciting adventure module compatible with OSRIC and 1E game systems, for 4-6 player characters of zero level. 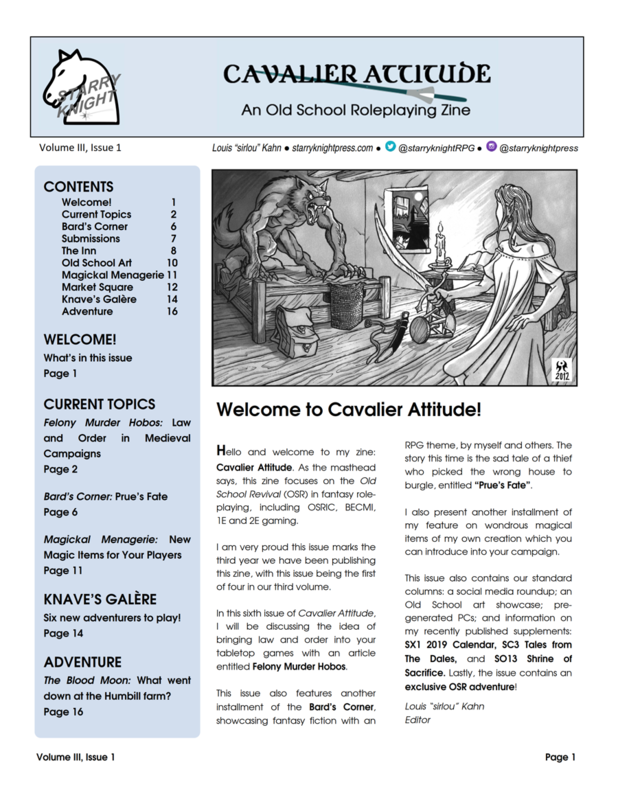 Our ninth book is the inaugural issue of our new Old School role-playing zine: "Cavalier Attitude". 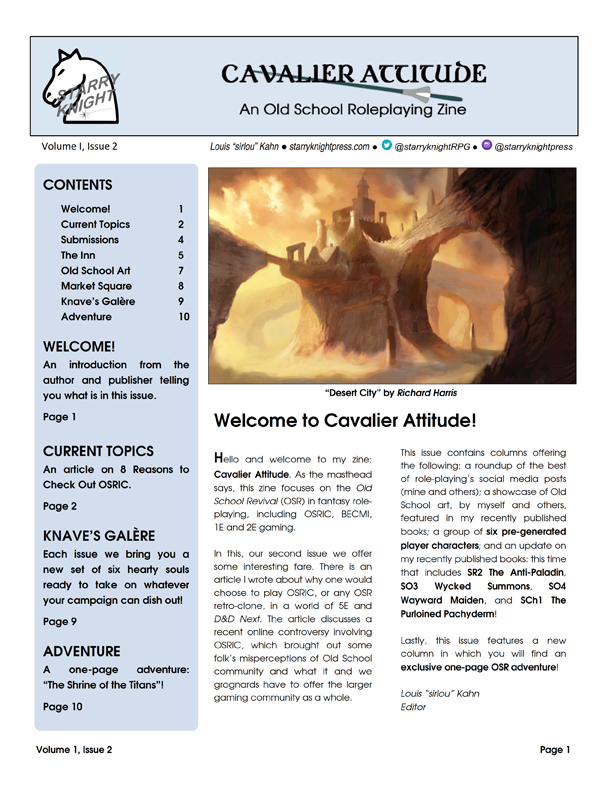 This is a quarterly zine that features articles, art, news, role-playing aids and fantasy fiction for both the Old School (OSRIC, !E and @E) and 5E gamer. 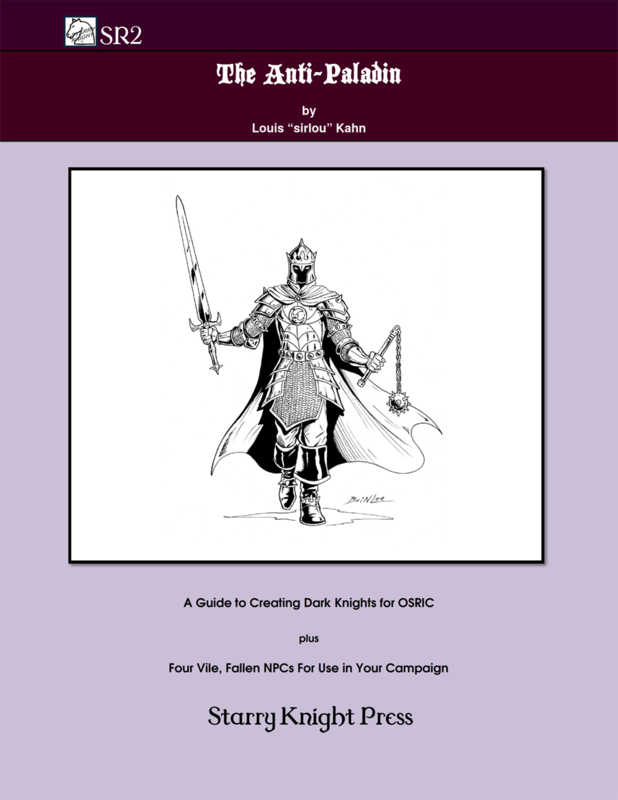 Our tenth book contains a BRAND NEW NPC/PC CLASS for use in your Old School OSRIC, 1E & compatible retro-clone campaign! It includes a detailed system for creating these dark knights, as well as FOUR ANTI-PALADINS of 4th, 8th, 12th and 16th level. Our eleventh book, our third one-shot, takes place on Samhain, where your players must escape the dungeon of the mad god Balor of the Evil Eye. It's compatible with OSRIC, 1E and 2E game systems, for a party of 4-6 players of levels 4 to 6, or a group as small as one DM and one player! In our twelfth book, and our fourth one-shot adventure, your players must rescue The Maiden of Iasgairen, who has been kidnapped by scurrilous pirates bent on revenge! It's compatible with OSRIC, 1E and 2E game systems, for a party of 4-6 PCs of levels 6 to 8. "THE SHRINE OF THE TITANS”. 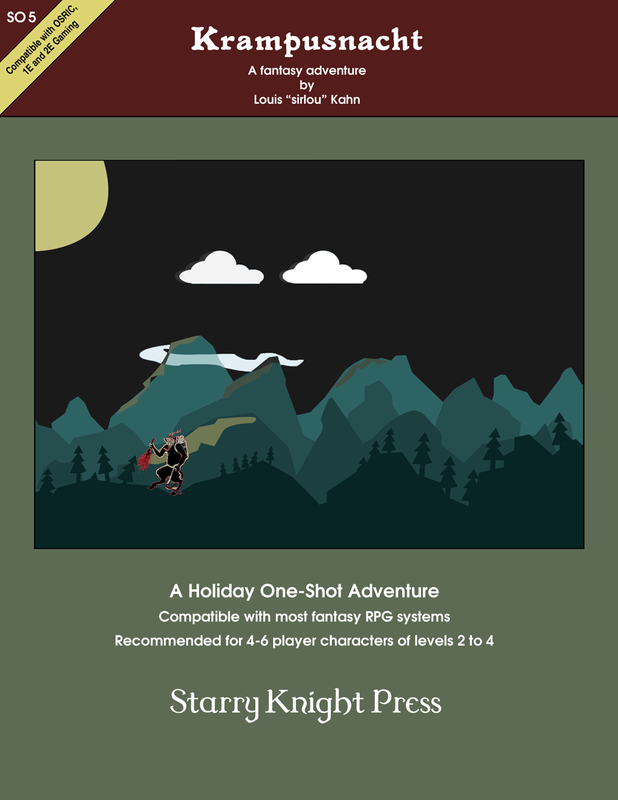 Our sixteenth book and fifth one-shot is a HOLIDAY adventure in which your players must save the elven children taken by KRAMPUS, and return them and the Alfstone that protects their village! Compatible with most fantasy RPGs and meant for 4-6 players of 2nd to 4th level, but easily modified! 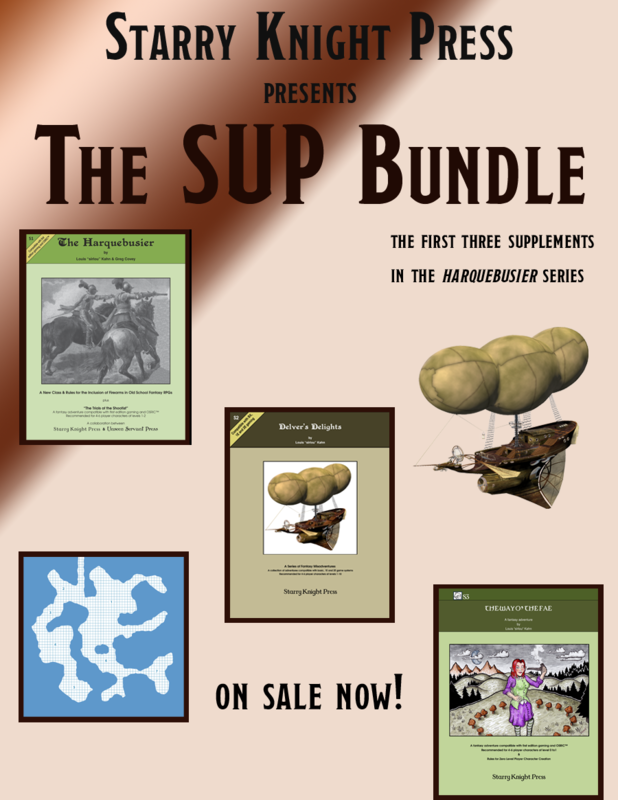 This bundle collects the THREE BOOKS of the Harquebusier based "S-series". You get S1 The Harquebusier, S2 Delver's Delights and S3 Way O' The Fae, together for one low price! You can challenge your players with adventures that are suitable for players from Zero Level all the way up to the 10th level of experience! 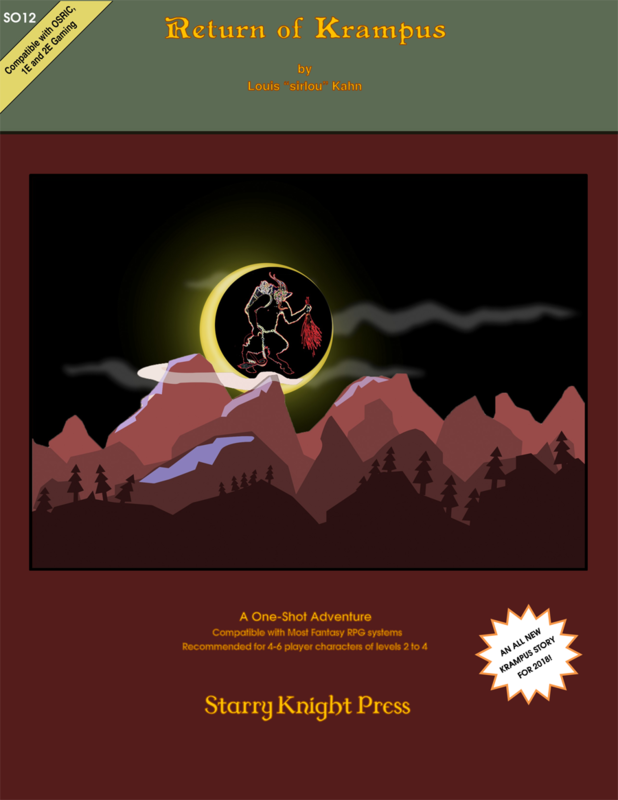 Our seventeenth book and sixth one-shot is a HORROR adventure in which your players must rescue a missing sage and take on a vampire court that has been trapped in their barrow lair! It is compatible with most fantasy RPGs and meant for 4-6 players of 6th to 8th level, but it is easily modified! 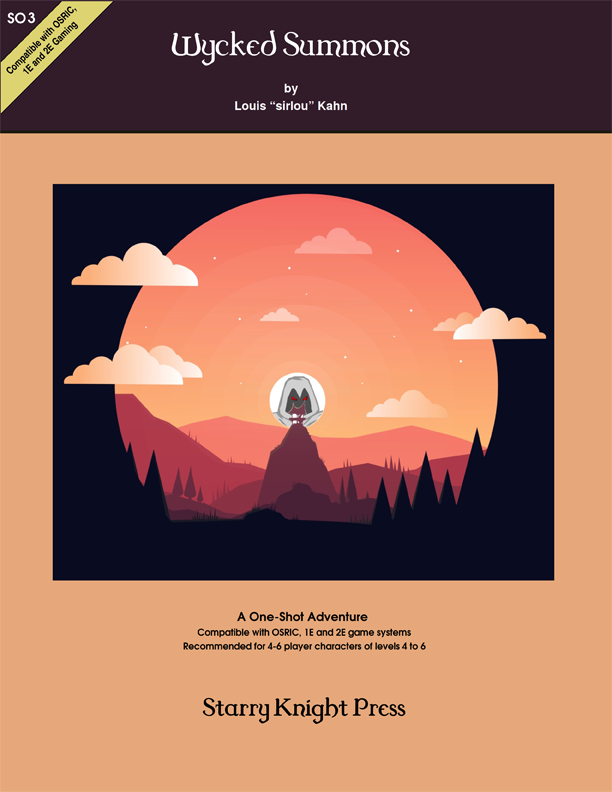 Our eighteenth book and seventh one-shot is a HIGH LEVEL adventure in which your players must investigate the strange goings on at an ancient mountain shrine, and defeat the GIANTS that have claimed the place as their own! It is compatible with most fantasy RPGs and meant for 4-6 players of 8th to 10th level. 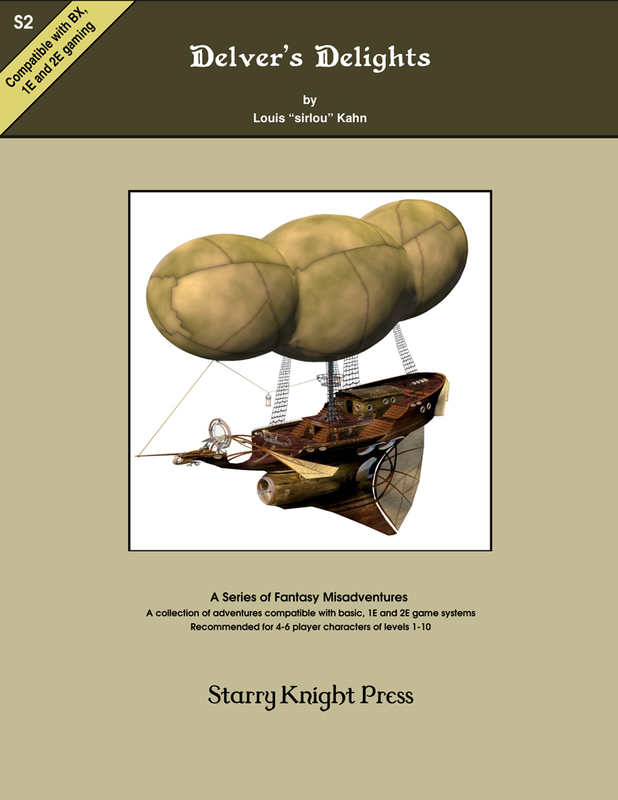 Our twentieth book and third rules supplement is the KNIGHTLY TOURNAMENTS! This guide provides rules for simulating medieval tournament style combat in OSRIC, 1E and retro-clone systems. It also includes 3 tournament scenarios to enjoy with players of any level in your campaign. Our twenty-first book and eighth one-shot adventure SEA HAG'S FOLLY is an exciting aquatic themed adventure where your players will face off against a sea hag and her underwater humanoid minions. It takes place above and below the waves! It meant for 4-6 players of 2nd to 4th level of experience! 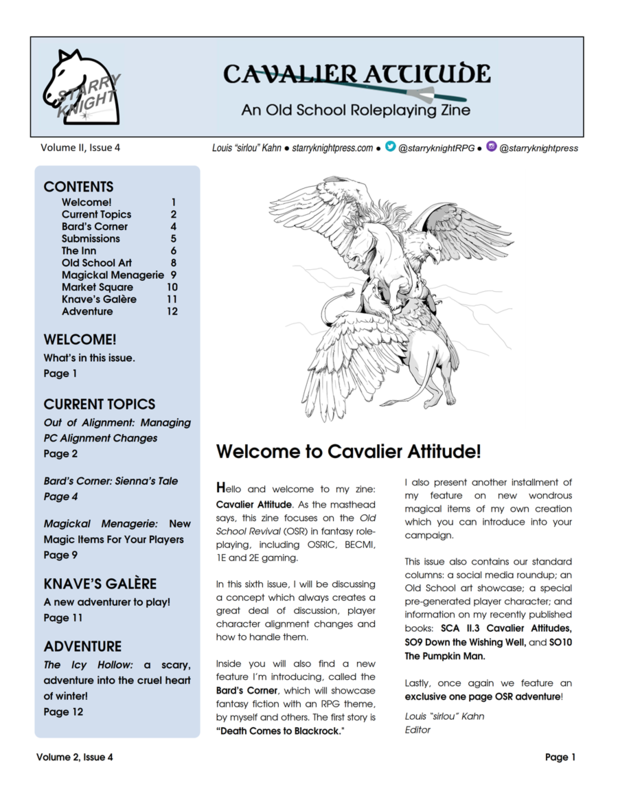 Our twenty-second book is the fourth issue of our Old School role-playing zine: "Cavalier Attitude". In addition to our regular features (articles, art, module synopsis, and social media round-up), it includes a BRAND NEW exclusive, OSR Under-Realm adventure setting: "THE CRYSTAL TAVERN”. Our twenty-fifth book is the epic dungeon THE MINE OF MAYHEM. Your players are sent to investigate an attack on a dwarven mines, and end up on the front lines in the war between the surface and the Under-Realm! It is compatible with most RPGs meant for 4-6 players of 2nd to 4th level. 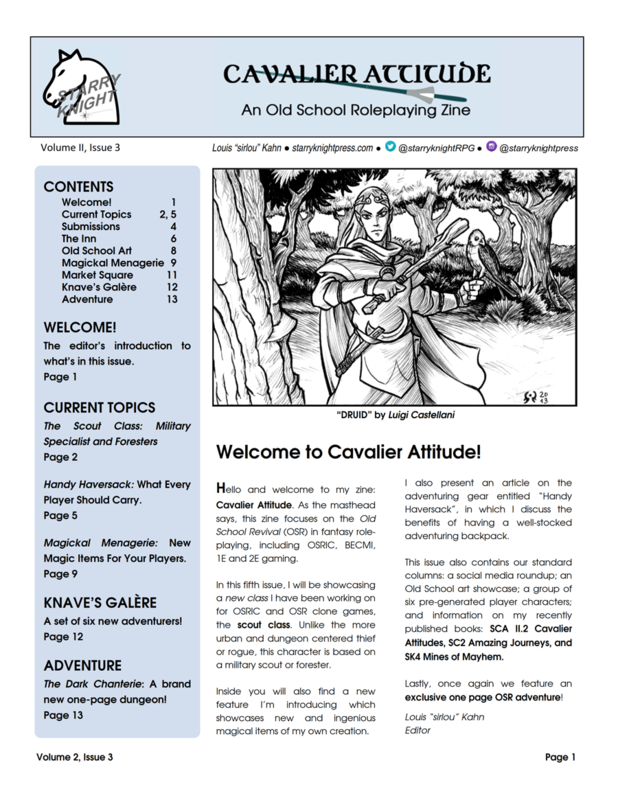 Our twenty-sixth book is the fifth issue of our Old School role-playing zine: "Cavalier Attitude". 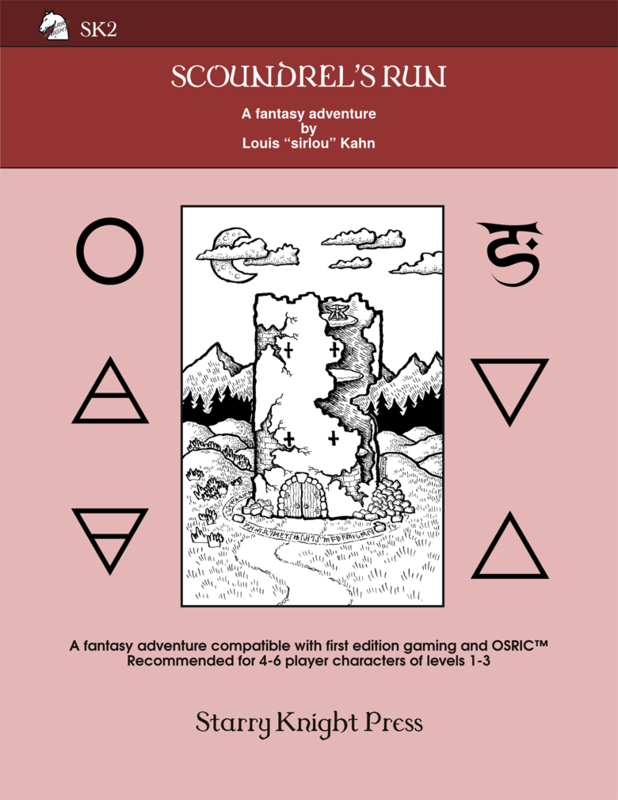 In addition to our regular features (articles, art, module synopsis, and social media round-up), it includes a NEW OSR adventure : "THE DARK CHANTERIE”, for 4 to 6 players of levels 12-16. 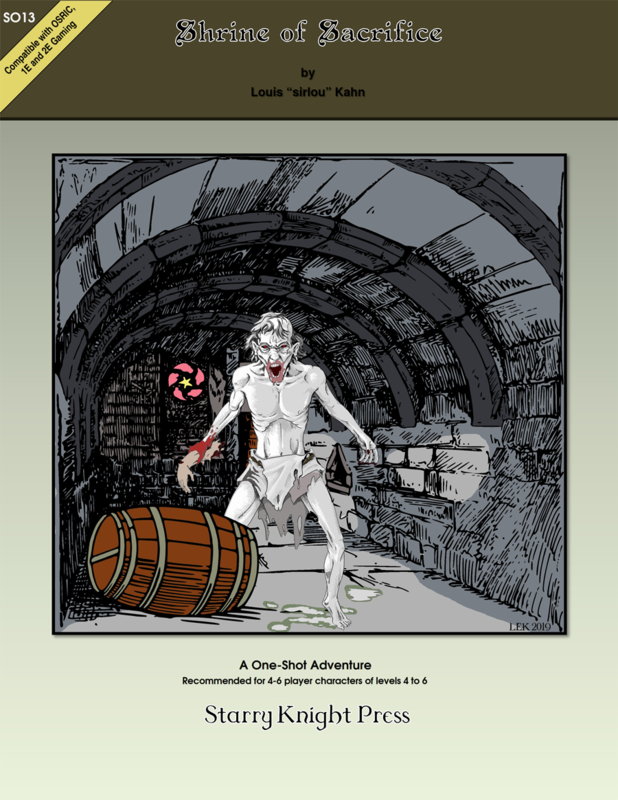 Our twenty-seventh book is the dungeon adventure DOWN THE WISHING WELL. It's your birthday & as a rite of passage you're climbing down the Old Well...but you're in for more than you bargained for! 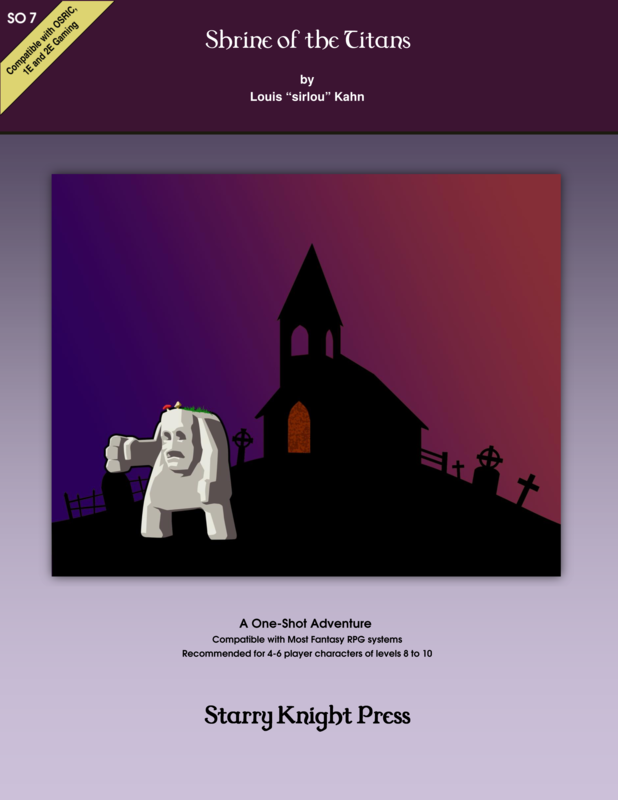 This ONE-ON-ONE adventure is also suitable for 4-6 players of 1st to 2nd level. 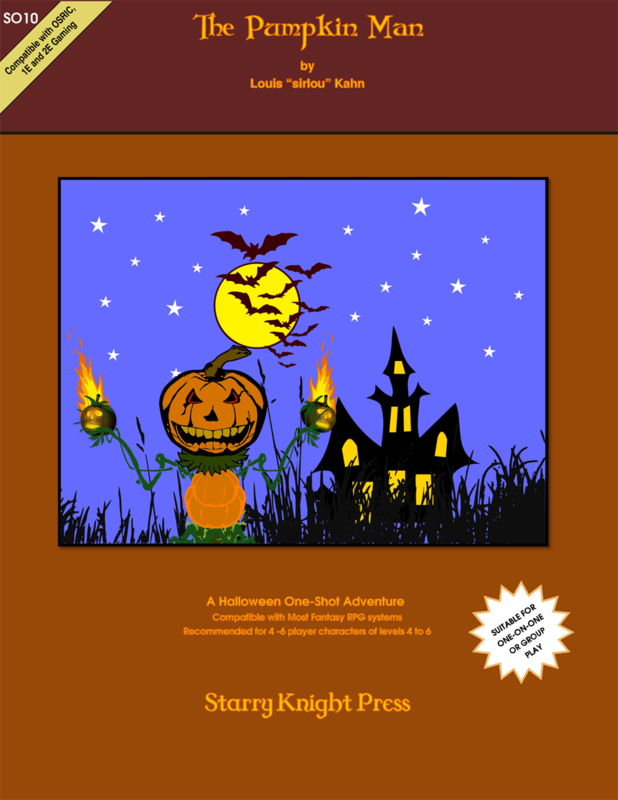 Our twenty-eighth book is the Halloween and Samhain themed adventure THE PUMPKIN MAN! Your party will take on the dreaded Pumpkin Man, and his undead minions, to rescue the Foggybottom clan's kidnapped children! A one-shot meant for 4-6 players of 4th to 6th level. 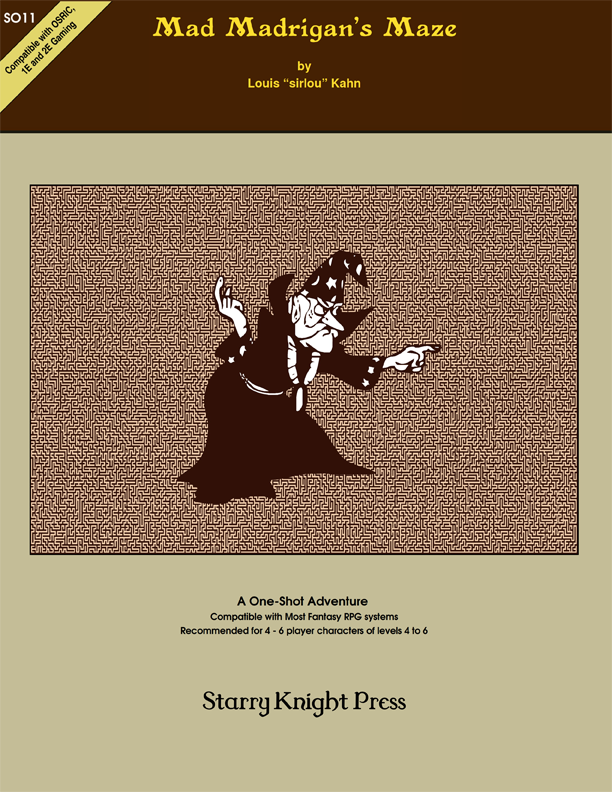 Our twenty-ninth book is the dungeon adventure MAD MADRIGAN'S MAZE. A mage tests adventurers by sealing them in his dungeon. With only one avenue of escape, you must fight your way out! Can you best the beasts and puzzles of the mad mage? For 4-6 players characters of levels 4-6. 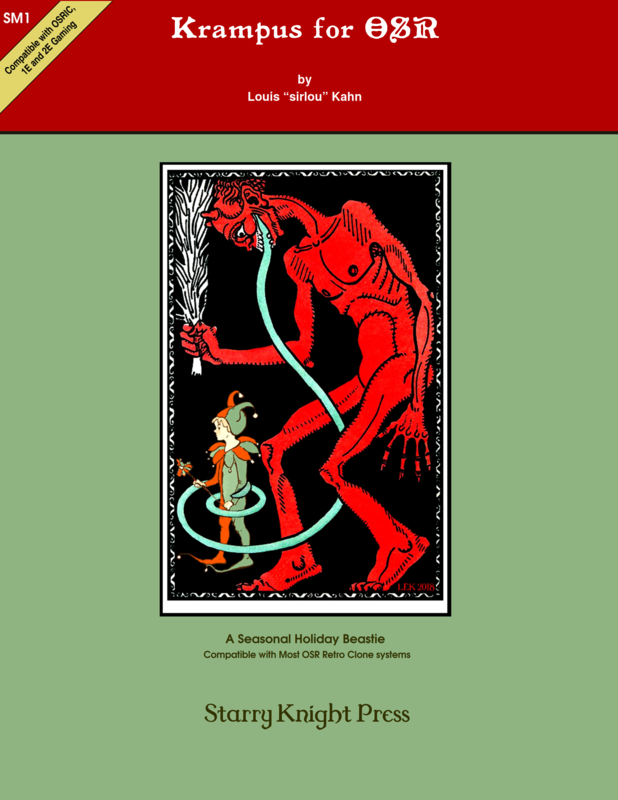 Our thirtieth book is a game supplement detailing the wonderfully devilish folkloric creature known as Krampus, and the Old School Renaissance (“OSR”) statistics which I designed to bring it to life in my OSRIC campaign world. Which I am now sharing with the world! 4-6 players of levels 4-6. Our thirty-second book is the wintry, holiday-themed adventure RETURN OF KRAMPUS. Your party must rescued the dwarven children kidnapped by Krampus and recover a sacred dwarven hammer! 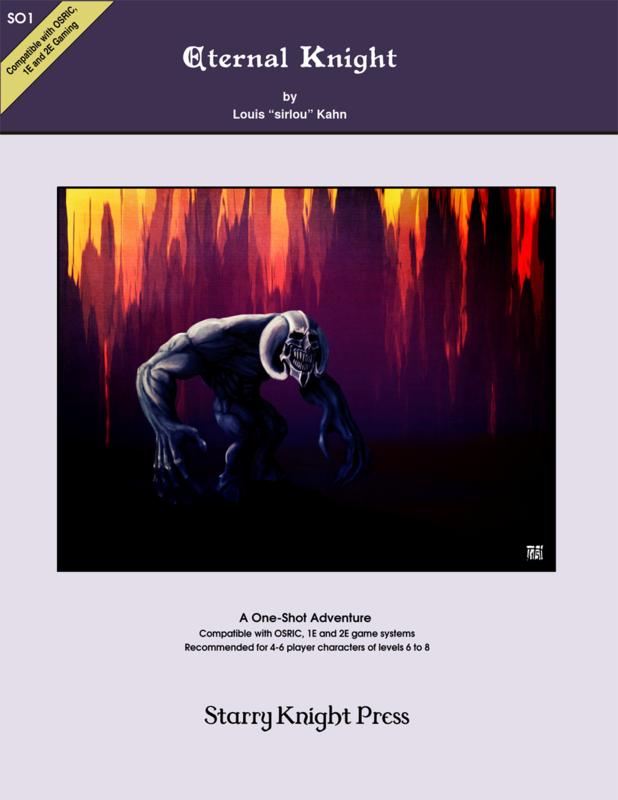 A one-shot meant for 4-6 players of 2nd to 4th level. Our thirty-third supplement is our very first gaming calendar. 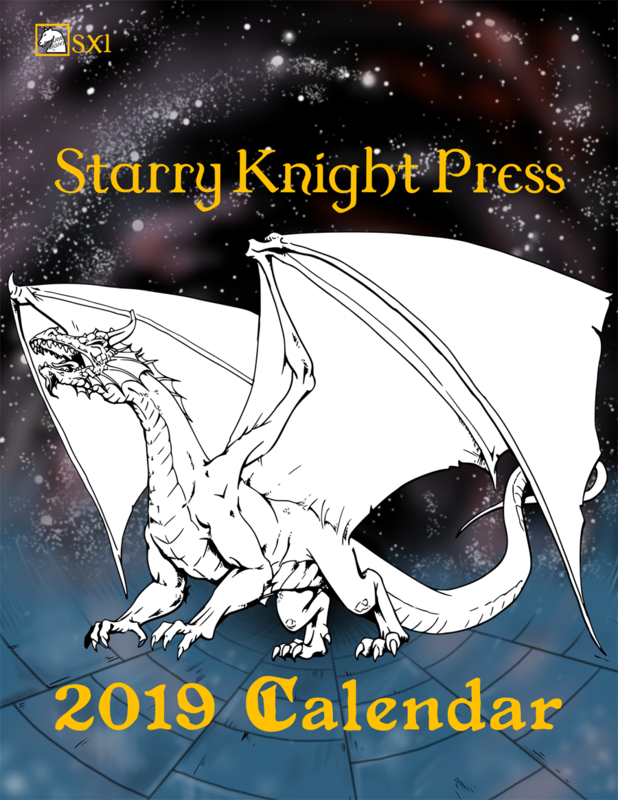 Each month showcases a different Starry Knight Press release, and it includes major holidays and significant artists' birthdays. It's released as a Pay What You Want (PWYW) product, so pay whatever amount you like. The calendar's recommended price is only $1. 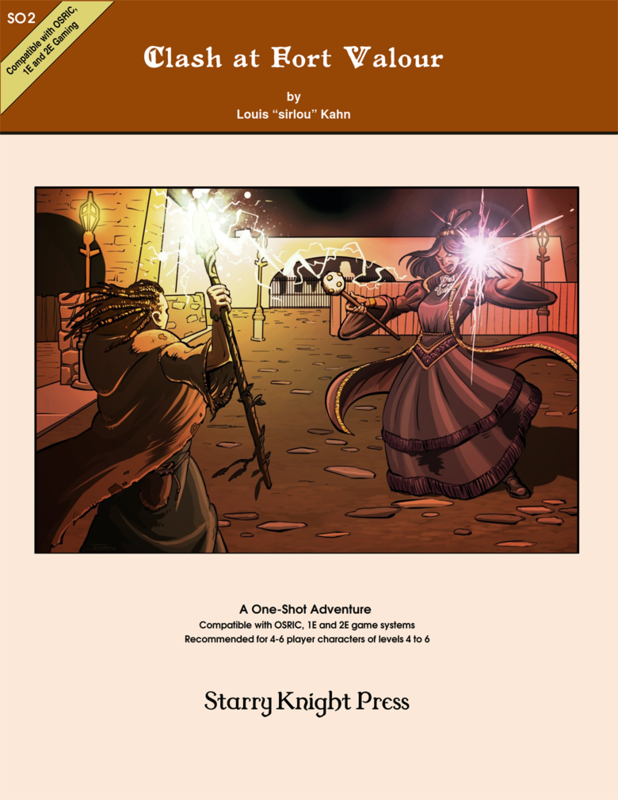 Our thirty-fifth book is our thirteenth one-shot adventure. Your players come upon an ancient, forgotten elven shrine in the woods. In order to clean the shrine they will have to destroy the undead and a demon which haunt this once grand structure. For 4-6 players characters of levels 4-6. 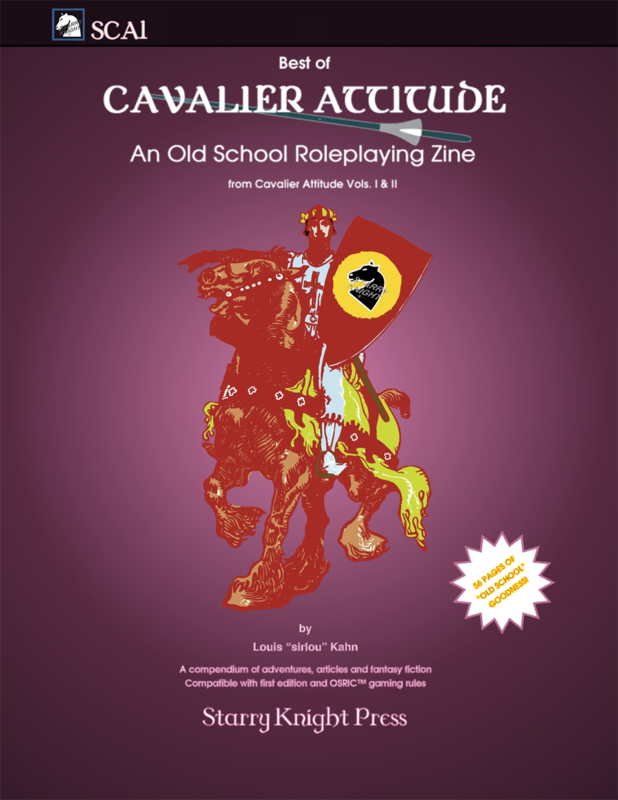 Our thirty-sixth book is the seventh issue of my Old School zine, CAVALIER ATTITUDE. 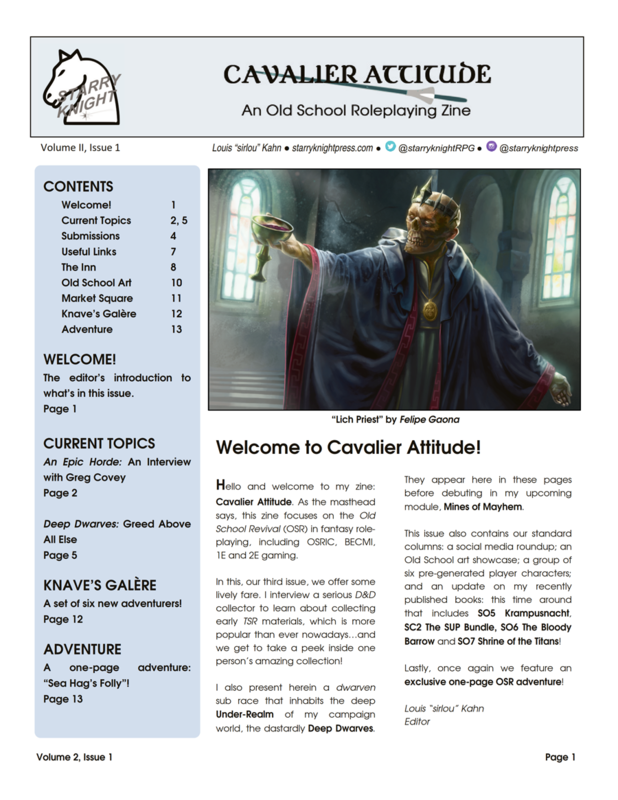 This issue features an article on law and order in medieval campaign, a new fantast short story, plus our standard features and a lycan-themed OSR adventure, BLOOD MOON, intended for 4-6 players of levels 4-6. Our thirty-seventh book is our fourth compilation supplement. This book combines the very best of the first two volumes (Volume I and II) of Cavalier Attitude, for a content-rich, reasonably price summary of the crème de la crème of Cavalier Attitude's first two years of publishing! Our primary means of payment is via PAYPAL. If you do not have a PayPal account, they are free and easy to set up. If you do not wish to use PayPal and still wish to make a purchase, please contact me directly via our CONTACT FORM to discuss this. For all PDF orders, we will deliver the product via your PayPal email address within 24 hours of the funds clearing. For all print orders, we will we will endeavor to ship the product within 72 hours of the funds clearing. For print orders, standard shipping & handling is included with the cost of each item purchased. Shipping to the Continental Unites States (CONUS), as well as Alaska and Hawaii, will be by First Class mail through the USPS. We use very heavy weight cardboard mailers to ensure your item arrives safe and sound, and we include tracking at no additional charge so you can see where your package is while en route to you. The bookshop is primarily for orders inside of the US, and while we welcome those who wish to place an order from outside the US, we just ask that you please email us FIRST via our CONTACT FORM. All PDF orders are shipped without tax, regardless of your location. For PRINT orders, sales tax will be collected for those buyers with mailing address in California. The rate is the rate for Los Angeles County, where my business is located.